The word November comes from the Roman word novem meaning ‘nine’ because it was the ninth month in the Roman calendar. Personally, however, I prefer the more evocative Anglo-Saxon term for November – Blotmonath or ‘the month of blood’ – the month when these ancient people slaughtered cattle in honour of the old pagan gods. Perhaps because it was the time when the cold winds first began to blow, the first week of November has always been a time of festivals and celebrations marking the end of the harvest and the beginning of winter. It also has more sinister connotations, as it is the time of year that is overshadowed by the coming of darkness and the threat of the supernatural. November is the month most associated with the ancient Celtic festival of Samhain (called Mí na Samhna in Ireland). Linguistically, the word combines the Gaelic words sam for ‘end’ and hain for ‘summer’ and chronologically it may have stretched over three days – October 31, November 1 and November 2. In the Iron Age, tribes of Celts populated Britain, Ireland, northern France and eastern Spain and the end of the summer was an auspicious time as it marked radical change in the daily lives of these pastoral people. It was a time of festival, plenty and preparation before the coming of the long winter, when the herds were brought down from the summer pastures in the hills, the best animals put to shelter and the rest slaughtered. 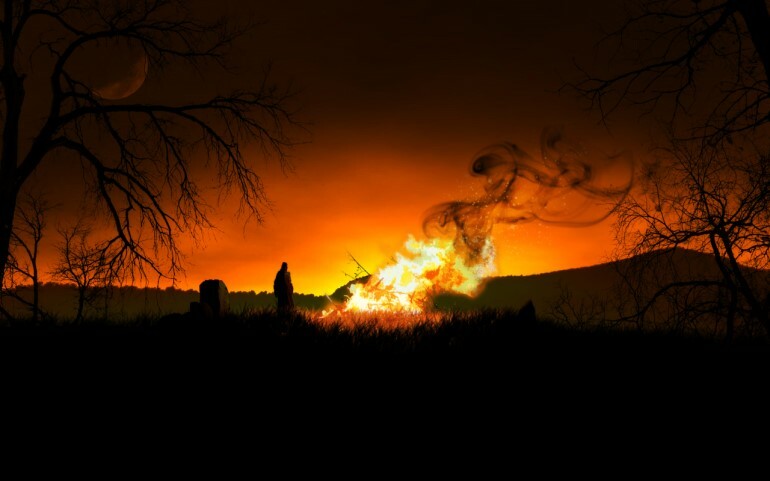 Although the bounty of nature and the natural change of the seasons were important aspects of Samhain, it was also a festival of the supernatural. The Celts believed that all turning points were magical and Samhain, as the most important turning point in the wheel of the year, was the most powerful and sacred of such junctures. The worlds of the living and the dead were very close to each other at Samhain, when the veil between the two was at its thinnest and it was possible (so it was believed) for the living to communicate with those who had gone beyond. There are numerous other traditions associated with November. In Mexico November 2 is known as el Día de los Muertos (Day of the Dead), and the whole month is especially dedicated to praying for the dead. November is the month dedicated to the Holy Souls in Purgatory in the Roman Catholic Church. The Zodiac signs for those born in this month are Scorpio and Sagittarius – evidence of further sinister connotations since the ancient ruling planet of Scorpio was Pluto, god of the underworld and ruler of the dead, while Sagittarius was associated with the demonic archer Sagittary, who was half-man and half-beast. Returning to the Saxons, November was the time when bone fires were lit on hillsides, ostensibly to burn any animal parts which were considered to be unfit for eating, but more likely to appease the gods and keep away evil spirits. At the ancient site of Avebury in England the site known as Windmill Hill still indicates a sacred place where such bone fires were ritually lit. In some parts of Britain November 4 is still called Mischief Night, traditionally a night when all sorts of naughty things were done – the main idea being to put things in the wrong place. November 5 was declared a holiday by a decree of Parliament after it was saved from being blown up by Guy Fawkes in the Gunpowder plot of 1605. Until 1859, all parish churches were required to hold services on this day and unlike today, celebrations continued throughout the day, with bells ringing, cannons firing and beer flowing. Effigies of traditional hate figures (like Fawkes and even the Pope on occasion) were thrown on bonfires while fireworks were let off triumphantly. To this day, just as in 1605, a new session of Parliament in London is still opened by the reigning monarch at the beginning of November. Nevertheless, perhaps unsurprisingly given the cold weather and long dark nights, November remains a month with mainly negative associations. The poet T S Eliot called it ‘Sombre November’, while Sir Walter Scott once wrote ‘November’s sky is chill and drear’. Lucky for everyone then, that it is also the precursor of December’s festive season but I’ll talk more about that nearer the time! Your post was great. I had no idea about the month of November being the month of blood! I would like to mention it in my own blog if that is ok with you. Please let me know at jdc-witherton@gmail.com. Again, -a great post. Such a creepy time of year. Most people I know that have died have bit it this time of year too. Coincidence? Maybe. But I guess there’s always a 1 in 12 shot. Thanks for posting this information. You’re performing a service. Wow. Among other things I’m an art historian, and I never knew most of this about November! El Dia de los Muertos of course (I live in Arizona), and Guy Fawkes Day most certainly. But “The Month of Blood,” the fires, the true meaning of Samhain…I suddenly like November so much more. Thanks for stopping by my blog–I’m so glad I found yours! Keep writing, ’cause I’ll keep reading.